Find a function where the arc lenth and area between any two randomly defined points is the same. There are two. I'm sure I know what BMAD was saying. Yes, ignore the units / squared units difference. The problem doesn't involve a circle though. You need to find a function f(x) such that the area under the curve between two points is the same as the arc length between those two points along the function. Here the arc length is like the length of a string representing the function cut at the two points. If the function was a straight line, you could use the Pythagorean theorem to find it. If you assume the arc length was a straight line, and slowly bring the points on the function closer together, eventually you get the change in y approaching the slope of the line times the difference in x's. The arc length for that infinitesimally small section is then sqrt( ( f'(x)dx )^2 + dx^2 ) = sqrt( dx^2 * (f'(x)^2 + 1 ) = sqrt( f'(x)^2 + 1 ) dx. Where f'(x) is the derivative of f(x). 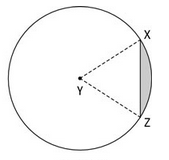 Integrate that between two points to get the arc length between those two points. If you evaluate the integral between 0 and 1 you end up with arc length = sqrt(5). Which is the same as if you just used the Pythagorean theorem. Yeah, I'm too lazy right now to find a function that ends up with a nice arc length function that isn't just a straight line. Find a function f(x) such that F(x) = integrate( sqrt( f'(x)^2 + 1) ), where F(x) is the indefinite integral of f(x) and f'(x) is the derivative of f(x). One answer is simple, the other is less so.